FETAC Level 6 Manual Handling Instructor. 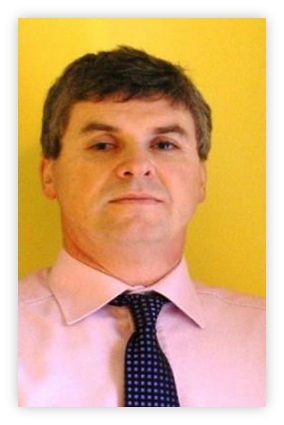 Qualified as a Chartered Physiotherapist in 1985, Fintan has over 30 years experience in a variety of working environments including (teaching) hospitals, private practice, within sports clubs & teams and in work related health & safety consultancy. Having trained in London in the 1980’s he has developed his clinical skills as a specialist musculoskeletal and sports physiotherapist (specifically to treat muscle, ligament and joint related problems) throughout his career. He has pursued an interest in work related injuries, and their prevention, through working in the area of Health & Safety, Manual Handling and Ergonomics. Throughout his career, Fintan has pursued an active programme of CPD (Continuous Professional Development) and regularly attends professional development courses in order to stay at the cutting edge of his profession. In 1991 he came to work at Ennis General Hospital and established the first private physiotherapy and sports injuries practice in Ennis, Co. Clare. In 1994 Ennis Physiotherapy Clinic moved to its current location on Barrack Street where it remains as one of the longest established businesses on the street. He was Lead Physiotherapist to the Irish Paralympic Team from 2002 to 2012 and has attended three Paralympic Games (Athens, Beijing and London) in support of the Irish Paralympic Team. He was actively involved in the sports + medical science preparation of the athletes across a wide variety of sports and has collaborated with Coaching Staff, Performance Directors, Sports Scientists and the Medical Officers in each Paralympic and able bodied sport. His is a National Classifier for Paralympic Athletes. He is experienced in working within the management structures of National Governing Bodies. He has lectured to under + post-graduate students at Irish universities including Trinity College Dublin, NUI Galway and UCD. He has presented a number of papers Health & Safety conferences. He has 20 years experience as a Health & Safety Consultant and Trainer (specialising in the area of manual handling training / lifting at work, MSDs, Ergonomics, work posture and seating in both manufacturing and office environments.